As you age, your face will reveal your years more than any other part of your body. Your eyelids are one of your most telling features and often one of the most memorable aspects of your appearance. Your eyes do not need to give away your age unless you want them to. Even a minimal change to your eyelids has the power to dramatically improve your overall appearance. Eyelid surgery can help restore a bright, more youthful appearance leaving you looking naturally alert, well-rested, and refreshed. A blepharoplasty can remove that extra upper eyelid skin (upper blepharoplasty) and treat the fat pockets under the eyes (lower blepharoplasty) to smooth the lower lid, making a person look as young as they feel…or younger. These procedures can be combined or done singly as your specific anatomy dictates to give you a more youthful, rejuvenated and refreshed look. These procedures can also be combined with other facial rejuvenation techniques such as Laser Resurfacing, Botox Cosmetic, Fat Transfer, and Face/Neck lift to optimize your result and have you looking and feeling great. To learn more about how the eyelid surgery can refresh your appearance and treat the signs of facial aging, schedule a consultation with Dr. Daniel Brown. Blepharoplasty, otherwise known as ‘eyelid surgery,’ is a surgical procedure intended to correct minor aesthetic defects of the eyes caused by aging. Eyelid surgery involves the removal of excess skin and/or adding or removing fat from the eyelids. This surgery can improve facial symmetry, enhance eyelid definition, and rejuvenate undesirable effects of the aging process. Excess, drooping upper eyelid skin or large pouches under your eyes can give the appearance of chronic exhaustion, no matter how young you are or how you feel. A blepharoplasty can remove that extra upper eyelid skin (upper blepharoplasty) and treat the fat pockets under the eyes (lower blepharoplasty) to smooth the lower lid, making a person look as young as they feel…or younger. These procedures can be combined or done singly as your specific anatomy dictates to give you a more youthful, rejuvenated and refreshed look. Eyelid surgery can help both men and women regain a youthful appearance and renew their confidence in life. Whether you have been unhappy with the appearance of your eyes for years, or are simply frustrated with the natural results of the aging process, eyelid surgery can revitalize your upper and/or lower eyelids. These procedures can also be combined with other facial rejuvenation techniques such as Laser Resurfacing, Botox Cosmetic, Fat Transfer, and Face/Neck lift to optimize your result and have you looking and feeling great. Dr. Brown offers his caring communication style, surgical expertise, and knowledge of human anatomy towards designing a unique treatment plan for each individual patient. As a leading board-certified aesthetic plastic surgeon, Dr. Daniel Brown specializes in facial rejuvenation and is known for giving patients refreshed, natural-looking results with a 5-star concierge service. Dr. Brown is dedicated to providing patients with remarkable, natural-looking results that fit their unique anatomy. Eyelid surgery can significantly benefit both men and women who want to improve their upper and/or lower eyelids. 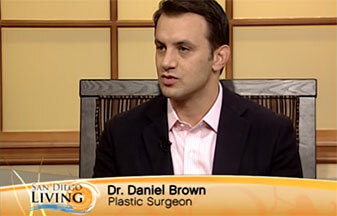 At Daniel Brown, MD Cosmetic Plastic Surgery, with three convenient locations in La Jolla, Coronado, and Del Mar California, Dr. Brown ensures that each patient receives world-class care and gorgeous results. Candidates for eyelid surgery are experiencing under eye bags, excess fatty deposits, or drooping eyelid skin. Generally, patients are 35 years or older and do not have any serious eye conditions. Whether you are interested in eyelid surgery as an aesthetic enhancement or because you are experiencing eyelid-related impaired vision, Dr. Brown can help you restore a youthful appearance. To see if you are a good candidate for eyelid surgery, please schedule a complimentary consultation with Dr. Brown. Corrects drooping or sagging upper eyelids by gently repositioning or removing fatty tissue, and removing excess skin. This procedure utilizes an incision made within the natural crease of the upper eyelid. Improves aesthetic problems of the lower eyelid by tightening excess skin and muscle with fat removal in the lower eyelid area, through an incision made just below the lower lash line. This surgical technique improves lower eyelid cosmetic issues as well, but utilizes an incision behind the lower eyelid, leaving no visible scar. At your initial consultation, Dr. Brown will perform a comprehensive examination of your facial structure, specific concerns, and aesthetic goals to determine which type of eyelid surgery will achieve optimum results. Dr. Brown will provide you with direct recommendations customized to your unique anatomy in order to create outstanding, natural results. Any questions you may have will be gladly answered at this time. Take the first steps towards an ideal, refreshed appearance by scheduling a complimentary eyelid surgery consultation. At Daniel Brown, MD Cosmetic Plastic Surgery, everyone who walks in the door is special and deserves the utmost attention and care. Dr. Brown provides confidential, private service and is dedicated to helping you feel comfortable and relaxed while he delivers the results you desire. Prior to your eyelid surgery, Dr. Brown may ask you to complete other medical tests specific to your case. Please refrain from smoking and taking anti-inflammatory medications the 2-3 weeks leading up to your surgery date due to the associated increase in the amount of bleeding. Dr. Brown may prescribe pain medication, which you will need to pick up before your procedure so it is readily available afterward. Patients will not be able to drive after their eyelid surgery, so please arrange for a friend or family member to take you home. We highly recommend having this person spend the first night of recovery with you. Patients generally take 3-5 days off from work to ensure sufficient rest for proper healing. Eyelid surgery patients should have enough ice cube, ice packs, gauze, and washcloths stocked to last them through the entirety of their recovery. On the day of surgery, you should wear something that wraps around you as opposed to a pullover as you do not want to accidentally brush anything against your eyes. Depending on your specific concerns and aesthetic goals, your eyelid surgery will address the upper and/or lower eyelids. Your procedure can also be combined with other facial rejuvenation techniques such as Botox, Brow Lift, Laser Skin Resurfacing, Fat Transfer, and Face/Neck lifts to enhance your overall results. Typically, eyelid surgery is performed under local anesthesia with oral sedation; however, there is an option for Dr. Brown to perform eyelid surgery under general anesthesia as well. Your eyelid surgery results depend on precise adjustments, which Dr. Brown makes in order to enhance the overall definition and symmetry of your eyelid. All incisions will be discreetly concealed by the eye’s natural shape so as to avoid any visible scarring. During the procedure, which usually lasts between one and two hours, Dr. Brown will remove or carefully reposition specific areas of fat and skin, while tightening the adjoining musculature that surrounds the eyelids. Certain patients may benefit from alternative procedures that offer similar results to eyelid surgery. Eyelid surgery can provide you with a rejuvenated, more youthful appearance but it does not address all eye wrinkles. Botox is an FDA-approved and minimally invasive injectable that helps diminish frown lines and crow’s feet. Dr. Brown can inject Botox into the facial muscles that lie below the wrinkled skin, which temporarily paralyzes them. Consequently, these muscles do not work as hard or move as much, which softens wrinkles and prevents new ones from forming. Otherwise known as a ‘forehead lift,’ a brow lift is a procedure which raises low sitting brows to a rejuvenated, more youthful position. Eyelid surgery can raise the upper eyelid but a brow lift is also an effective option for patients experiencing sagging upper eyelids or low sitting eyebrows. By raising the eyebrows, forehead wrinkles are reduced and the upper eyelids are raised, which can improve vision and cosmetically enhance the overall appearance of the eyes. Dr. Brown can simultaneously perform a brow lift with eyelid surgery. Laser skin resurfacing is a popular option for patients who do not require a surgical procedure but still desire a refreshed appearance. By removing the damaged top layer of skin, this non-surgical alternative addresses acne scars, wrinkles, and blemishes revealing reinvigorated, brighter skin. Dr. Brown has a passion for helping people through plastic surgery and he recommends a week of downtime to recover from eyelid surgery. At Daniel Brown, MD Cosmetic Plastic Surgery, we believe that every patient is a VIP and should receive world-class care. Dr. Brown provides 5-star concierge service and ensures that each patient is informed on how to best recover from eyelid surgery. In order to experience optimal results, it is important to avoid sun exposure after surgery and wear darkly-tinted sunglasses until healing is complete. Some of the most common side effects of eyelid surgery include bruising, irritation, swelling, and dry eyes, all of which are typically mild and temporary. Dr. Brown advises patients to use over-the-counter pain medications, compresses, and ointments to help during recovery. Most patients will feel ready to return to work and their everyday lifestyle after a week. The cost of your eyelid surgery depends on your specific case and whether or not you require any additional treatments and procedures. Please schedule a private consultation with Dr. Brown to receive a quote.